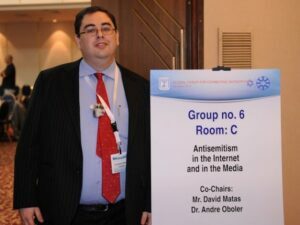 As co-chair of the Working Group on Antisemitism on the Internet and in the Media, OHPI’s CEO, Dr Andre Oboler, delivered a summary of the Working Group’s meeting and plan of action to the plenary. The Working Group was made up of about 50 international experts in the field of online hate and the plenary included 450 people including government ministers from various countries, diplomats, Jewish community leaders, leaders from NGOs combating antisemitism, academics and members of the press. During the presentation Dr Oboler launched the Working Group’s major report into Online Antisemitism, “Online Antisemitism: A systematic review”.